Did you ever wish there were a time of UU worship other than (and in addition to) Sunday morning? Well, at the UUCiA, there is such a time! Come join us for UU Vespers — usually held on the third Thursday of each month (check our Calendar for specific dates) from 7 p.m. – 8 p.m! Rev. Lara Hoke leads a small, informal worship service of sharing, meditation, prayer and music. 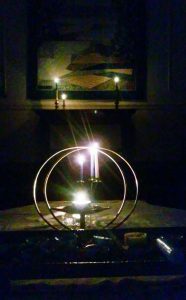 It’s a chance to experience our beautiful sanctuary in the evening, with candlelight, in a contemplative setting. Hope to see you there!